Christian Hohenadel and Andrea Piccini won the main event at the Sachsenring round of the FIA GT1 World Championship for the French Hexis Aston Martin team. Blancpain Enduranse Series Navarre race victory Vita4One drove the team's trio of Michael Bartels/Frank Kechele/Nico Verdonck. Finnish Markus Palttala car base was 13, and Mika VÃ¤hÃ¤mÃ¤ki was a team with partner Olivier Tielemans 21. Some automotive municipalities have already confirmed their participation later this year in the corridor of Belgium SPA's 24-hour race. Today we drove the Super GT series in Japan's Okayama race which was originally intended to drive competition, but the season opener in Japan because of the damage it was moved to a later time point. Drove to victory Tsugio Matsuda/Joao Paulo Lima de Oliveira, duo, ranked second, Ikawa/Yamamoto. The FIA and Le Mans organiser the Automobile Club de l'Ouest are to join forces on a new FIA World Endurance Championship from 2012. Such a move had been mooted since the ACO combined its headline events - including the Le Mans 24 Hours - into the new Intercontinental Le Mans Cup, which made its debut with a three-round pilot series at the end of last year. Today the FIA announced that its World Motor Sport Council had agreed to go ahead with a collaboration with the ACO on a global sportscar championship starting next season. "The calendar, comprising at least six events, will include the Le Mans 24 Hours," said an FIA statement. "FIA World Endurance Championship titles will be awarded to constructors and drivers, and an FIA GT Endurance World Cup will be created for constructors." The FIA also revealed that it had approved plans for the current GT1, GT2 and GT3 classes to be combined next year. All three types will then be able to compete - with performance balancing - in what is currently the FIA GT1 World Championship. "From 2012 a new 'GT World class' will be created, balancing the performance of 2011 GT1 cars, 2009 GT2 cars and 2011 GT3 cars to enable them to compete in a single FIA GT World Championship," said the statement. "A review of the performance of these three categories of cars will be conducted in order to open up the championship to a greater number of makes." World GT1 currently relies on several designs adjusted from the previous FIA GT1 rules, with only Nissan and Matech Ford having created cars specifically for the new world championship regulations that came into force last year. You can see Finnish Markus Palttala is involved in this weekend, at least in the Belgian Racing crew and Dimitri Enjalbert is Matteo Bobbi new partner. Tomas Enge and Alex Muller lost Saturday's win in the race the rear wing due to technical reasons and, consequently, they fell at # five. Was declared the winner of Richard Westbrook / Peter Dumbreck duo. JRM Nissan claimed the Tourist Trophy with a thrilling victory in the Championship Race at Silverstone. Former F1 driver Stefan Johansson could rent later this year, the former HighCroft Racing HPD LMP1 car use is perhaps the ALMS series tells Mariantic. 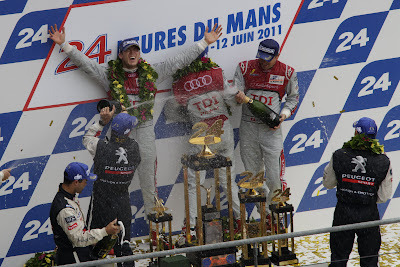 Benoit Treluyer, Andre Lotterer and Marcel Fassler won the 2011 Le Mans 24 Hours at a very necessary gallop for Audi, hounded throughout by Peugeot rivals that had to stop less often. The #9 908 of Simon Pagenaud, Sebastien Bourdais and Pedro Lamy crossed the line 13.854s behind the Audi, and had the R18's drivers not gone flat out throughout to make up for their car's marginal deficit in range this race could easily have gone the other way. For fans of statistics, this is the fourth closest Le Mans finish of all time, all will certainly go down as one of the classics. Last week: Eurosport also say some Wirth personel have gone to work for Toyota in Cologne. Manthey Racing and its drivers Marc Lieb, Lucas Luhr, Timo Bernhard and Romain Dumas won the 39th ADAC ZURICH NÃ¼rburgring 24 Hours. The Porsche 911 GT3 RSR dominated the race and beat the BMW Motorsport BMW M3 GT by almost 4,5 minutes, taking the fifth ever overall win for Manthey Racing. Chrysler is evaluating a return to international GT competition with the next generation of Viper, AUTOSPORT magazine has revealed this last week. Former Spyker F1 driver Markus Winkelhock and Marc Basseng moved into the GT1 World Championship points lead by taking a comfortable win in the Navarra qualifying race. Basseng had followed the sister All-Inkl Lamborghini of Nicky Pastorelli in the early stages, relentlessly looking for opportunities to pass his team-mate. Anthony Davidson and SÃ©bastien Bourdais have won the Imola 6 Hours beating their team-mates, StÃ©phane Sarrazin and Franck Montagny giving Peugeot Sport Total a double, and a revenge victory over the two Audi R18 TDIs in third and fourth places. In LM P2, the win went to the Greaves Motorsport Zytek Z11SN â€“ Nissan driven by Karim Ojjeh, Tom Kimber-Smith and Olivier Lombard.After a no-holds-barred scrap, Ferrari snatched victory in LM GTE Pro thanks to Jaime Melo and Toni Vilander in their no. 71 AF Corse, Ferrari F458 Italia. In LM GTE Am, the no. 67 IMSA Performance Matmut Porsche 911 RSR came out on top. 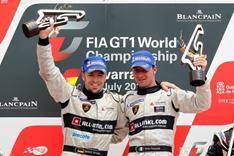 The All-Inkl Lamborghini team delivered its second one-two of the Navarra weekend in the main GT1 World Championship race, though this time it was Nicky Pastorelli and Dominik Schwager who led home team-mates Marc Basseng and Markus Winkelhock after the latter pair were penalised. Alms his weekend is Lime Rock Park. Dyson Racing Team Chris Dyson/Guy Smith took the win ALMS season opener, the second result came Muscle Milk Aston Martin Racing duo of Klaus Graft/Lucas Luhr and Dyson Racing, another car base Humaid Al Masaood/Steven Kane was third. LMPC class was the fastest in Genoa Racing Elton Julian/Eric Lux, and GT side celebrated the victory on the BMW duo of Joey Hand / Dirk Muller. Olivier Panis has called time on his Le Mans racing career, stating that his fifth position in last weekend's event will be the last result he will post at La Sarthe. Nissan drivers Lucas Luhr and Michael Krumm took first blood at Paul Ricard by winning the qualifying race for the latest round of the GT1 World Championship. JR Motorsport Nissan duo of Michael Krumm/Lucas Luhr drove yesterday's the way to victory, Paul Ricard, and they have followed the second and third placed Aston Martin duo of Stefan Mucke/Darren Turner and Alex Muller/Tomas Enge. United Autosports can participate in this year's ALMS Petit LMP2 car race and next year possibly move to the FIA â€‹â€‹World Endurance Championship. Jaguar is beginning to plan for its first bid for outright honours at the Le Mans 24 Hours since 1991, this week's AUTOSPORT magazine reveals. The British manufacturer's Indian owner, Ratan Tata, and bosses at Jaguar parent company Tata Motors are known to be evaluating a return to the prototype ranks with an all-new LMP1 car. The Muscle Milk Lola-Aston Martin of Lucas Luhr and Klaus Graf notched up its second American Le Mans Series race win of the year at Mosport Park. During the Le Mans Series summer break, it is time, after the official announcement of the creation of an FIA World Endurance Championship in 2012 and two races before the end of the season; Silverstone on 9, 10 and 11 September and Estoril on 23, 24 and 25 September, to talk about the future. In 2012, the calendar will be made up of five or six races from March to October held exclusively on famous European circuits. The format will remain identical with 6 hour races. The Le Mans Series teams will have priority to obtain an entry in the 24 Hours of Le Mans to complete the grid participating in the World Championship and also in the two European rounds of the World Endurance Championship. 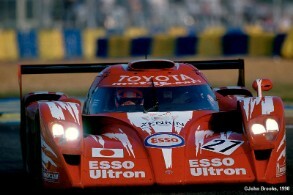 In 2012, the FIA World Endurance Championship and Le Mans Series will have to live apart. At Imola the teams were consulted to understand their requirements for the upcoming season. It has been decided that LMP1 prototypes will no longer be accepted as their formats and running costs are better adapted to the World Endurance Championship. The LMP2s will be at the top of the event's bills, followed by GTE Am & Pro, Formula Le Mans and newcomers, the GTCs. This last category will gather Â« One make series Â» cars such as the Porsche Carrera Cup or Ferrari Challenge. In 2012, 20 to 25 prototypes and the same number of GTs promise interesting starting grids. At the moment the calendar is being prepared and it will have no clashes with the World Endurance Championship one. The season's first appointment will be official tests. The rest of the calendar will be confirmed by the end of the season. There are still two races before the 2012 season. In LMP1, the Pescarolo Team is lying equal with Rebellion Racing. In LMP2, Greaves Motorsport, 24 Hours of Le Mans and 6 Hours of Imola winner, gets closer and closer to a victory in their category. AF Corse leads in LM GTE Pro and the team is doing all it can in LM GTE AM to outwit IMSA Performance Matmut's projects. In Formula Le Mans, Pegasus Racing must continue to widen the gap with the other competitors to take the final title. It goes without saying that the season's last two races will be fiercely fought and put on an exciting show. For thirteen hours the nr33 Audi Sport Team WRT (Belgian Audi Club) Audi R8 LMS of Timo Scheider, Greg Franchi and Matthias Ekstrom led the largest field of cars to take part in theTotal 24 Hours of Spa for many years and after completing 545 laps Scheider took the chequered flag to record his second win, and Audiâ€™s first, in the worldâ€™s second oldest 24 hour race. The Audi finished two laps ahead of the nr76 Need for Speed Team Schubert BMW Z4 of Dirk Werner, Edward Sandstroem and Claudia Huertgen, after Huertgen started from 49th on the 62 car grid. The "SUGO GT 250km RACE," Round 4 of the 2011 AUTOBACS SUPER GT series, took place at Sportsland SUGO circuit (one lap: 3.704 km x 68 laps) in Miyagi Prefecture on July 31. In the GT500 class race the S Road MOLA GT-R driven by Masataka Yanagida and Ronnie Quintarelli, starting from pole position and running away to a perfect win without ever being threatened by the competition. 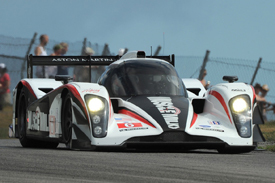 [url=http://www.americanlemans.com/primary1.php?cat=news|16058]Lucas Luhr and Klaus Graf[/url] gave the Muscle Milk Lola-Aston Martin squad its second straight ALMS victory as a late deluge caused the race to be halted 15 minutes from the finish. Le Mans: Jaguar denies it is working on an LMP1 race car. The 40th International Pokka GT Summer Special, Round 5 of the 2011 AUTOBACS SUPER GT was held at the Suzuka Circuit (one lap 5.8075km x 87 laps) in Mie Pref. on August 21. The GT500 class winner in difficult conditions with intermittent rain was the Weider HSV-010 team (drivers: Takashi Kogure / Loic Duval). This is the team's second win of the season. On and off sprinkling of rain from the afternoon of race day made for tricky race conditions. It was raining at the time of the start at 3: 10 and the track was wet. With proven performance in wet conditions, the S Road MOLA GT-R (Ronnie Quintarelli) pulled away at the start from pole position to open up a lead, chased by the Nissan teams MOTUL AUTEC GT-R (Benoit Treluyer) and CALSONIC IMPUL GT-R (Joao Paulo Lima de Oliveira) and also the Weider HSV-010 (Loic Duval). With its long 500 km distance and two mandatory pit stops and driver changes, the International Pokka GT is an endurance race where team strategy plays an important role. It was made even more complex this time by the varying rainfall during the course of the race. The GT-R machines did well during the early stages of the race, but as the rain grew lighter the Weider HSV-010 was able to pick up the pace. A crucial turning point came when the Weider HSV-010 made its first pit stop just as the track was beginning to dry out. Taking over the wheel from teammate Duval, Takashi Kogure was able to outrun the competition decisively on rain tires and take the lead. Being a long-distance race, however, it wasn't all smooth sailing for Kogure, as a red flag came out to clear a crashed car from the track and a spin-out of his own when hit by another car that caused him to give up the lead for a while. Nonetheless, Kogure managed to overcome it all with his blazing speed and build up a big lead before relinquishing the wheel to Duval again for the final stint. By that time, however, the track was nearly dry. Taking the gamble of running the last third of the race on dry slick tires, the S Road MOLA GT-R driven by Ronnie Quintarelli began to close the gap rapidly. Using the margin of lead he had to the fullest, Duval pressed on in the Weider and was finally helped out when rain began to fall again with a few laps remaining in the race, enabling him to hold off the charge of Quintarelli in the GT-R and take the win. For the defending champion Weider HSV-010 team, this is their second win of the season following the victory in round three in Malaysia. In the GT300 class race, the 3rd-place qualifying R&D SPORT LEGACY B4 (Tetsuya Yamano/Kota Sasaki) emerged the winner. The Yamano pair and their LEGACY B4 also won this race last year, and this is their first victory since. 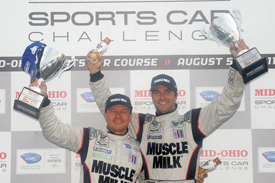 Muscle Milk Lola-Aston Martin duo Klaus Graf and Lucas Luhr inched closer to Dyson's Guy Smith and Chris Dyson in the American Le Mans Series title race by taking their fourth win of the year in the Road America round. The Ferrari F458 Italia claimed its first ALMS win as Risi's Toni Vilander and Jaime Melo emerged from a typically close-fought GT contest, passing the #55 BMW of Dirk Werner and Bill Auberlen late on. A dramatic GTC class finish saw Jeroen Bleekemolen move from third to first in the Black Swan car he shares with Tim Pappas in the final few laps, beating the #66 TRG car, while erstwhile leader Sean Edwards (NGT) slowed with a puncture. Maxime Martin took the chequered flag at the end of the 3-hour Blancpain Endurance Series race in Magny Cours, to give himself, Bas Leinders, Markus Palttala, the Marc VDS Racing Team and BMW their first victory in the series. Martin finished ahead of the nr9 AutOrlando Porsche of Paolo Ruberti after the Italian overtook Marcel Fassler's Belgian Audi Club Team WRT Audi R8 four laps from the flag to keep the driver's championship alive until the last round at Silverstone in October. Third place was enough to secure the Team's Championship for WRT. The win for BMW means that four different manufacturers have won the four rounds held so far with Prosche winning at Monza, Ferrari at Navarra, Audi at Spa and now BMW at Magny Cours. The nr2 ALD Vita4One Ferrari 458 Italia of Louis Machiels, Paul van Splunteren and Niek Hommerson secured victory in the Pro-Am Class after Machiels overtook the nr20 SOFREV ASP Ferrari after the Safety Car period 10-minutes before the chequered flag. Georges Cabannes secured the GT3 Gentlemens Trophy title after he secured his third win of the year alongside Gregory Guilvert and Fabien Michal, finishing a lap ahead of their nearest rivals. The GT4 Cup battle was won by the RJN Motorsport Nissan 370Z of Jordan Tresson, Alex Buncombe and Chris Ward after a close battle with the nr62 Lotus Driving Academy Lotus Evora of Andrina Gugger and Matthias Gamauf. The nr70 Lotus of Greg Mansell, Edoardo Piscopo and Leo Mansell finished 3rd to keep their championship hopes alive for the season finale at Silverstone in October.